When it comes to cabinet manufacturing, Cabinet Face Frame quality and yield directly impacts your bottom line. It doesn’t matter whether you are a two person shop or a plant employing hundreds of craftsmen. S4Shardwoods.com by Thomas & Proetz understands this and the dilemma every Cabinet Maker faces. Should you outsource or produce in-house? It can be a tough decision. S4SHardwoods.com can make that decision an easy one. With over a century of experience in the hardwoods industry, we know how to achieve the ultimate in quality, yield, & S4S moulder finish. Our ongoing investments in machinery, facilities, inventory, supply-chain, personnel, and training allow us to meet the highest customer standards. You can count on S4Shardwoods.com for all your Cabinet Face Frame needs. Cabinet Face Frame in S4S Poplar, S4S Red Leaf Soft Maple, S4S Premium Frame Alder, and S4S Red Oak. 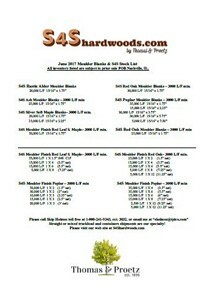 Other species such as S4S Cherry, S4S Hickory, and S4S Northern White Hard Maple are available upon request. S4S Cabinet Face Frame net widths in 1.5” – 1.75” – 2” – 2.25” – 2.5”. Cabinet Face Frame blanks available in 1.635″ and 1.875″ widths in S4S Poplar, S4S Red Leaf Soft Maple, S4S Premium Frame Alder, S4S Red Oak and a variety of other hardwood species.